FORT LAUDERDALE, Fla. -- Now formally facing the death penalty, the suspect in the Valentine's Day school shooting that killed 17 people in Florida appeared in court Wednesday on a 34-count indictment. 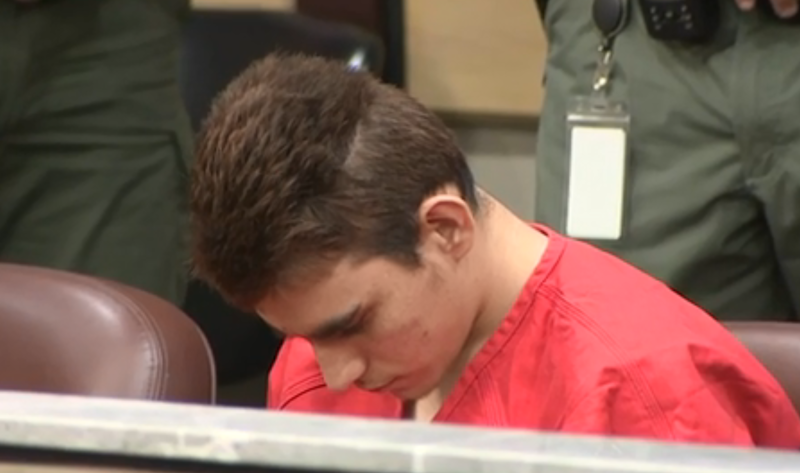 19-year-old Nikolas Cruz was arraigned in the Marjory Stoneman Douglas High School massacre. A defense attorney indicated Wednesday that Cruz would stand mute, meaning he will not enter a plea. A not guilty plea was entered on his behalf by Broward Circuit Judge Elizabeth Scherer. An attorney for Cruz said he is willing to plead guilty to all charges if the death penalty is not pursued. But Broward County State Attorney Michael Satz on Tuesday filed formal notice that prosecutors will indeed seek capital punishment. The matter was not further addressed in court Wednesday. Cruz appeared in court shackled, wearing an orange prison jumpsuit, and kept his head down. He showed no emotion. His defense attorney waived a formal reading of the indictment. Cruz's financial assets were discussed amid questions over whether he should be declared indigent. A defense attorney indicated Cruz' late mother had a $50,000 life insurance policy ready for disbursement, of which Cruz is entitled to half. It's not yet been paid out. Cruz also has $12,000 available in his mother's bank account, but he does not have access to it, the attorney said. Three lawsuits have been filed where Cruz is listed as a party, the attorney said, and said it was likely more suits would be filed. An indigency status hearing was scheduled for next month. "We are not saying he is not guilty but we can't plead guilty while death is still on the table," Finkelstein said. "This guy's is willing to plea and spend the rest of his life in the general population. Let him do that and let them do what they want with him," Guttenberg said. "Why not take the plea and let the guy rot in hell?"